Dr. Donald Balhoff is a native of Baton Rouge and an alumnus of Catholic High School (Baton Rouge). He completed his undergraduate studies and earned a Bachelor of Science in 1995 at the University of Notre Dame in South Bend, Indiana. While in college, Dr. Balhoff was a three-year captain of the Notre Dame Men’s Water Polo team. His dental studies were completed in 1999 at Louisiana State University School of Dentistry in New Orleans. During dental school, Dr. Balhoff was a member and president of the C. Edmund Kells Honor Society. He went on to receive his orthodontics specialty certification in 2001 at Nova Southeastern College of Dental Medicine in Fort Lauderdale, Florida. 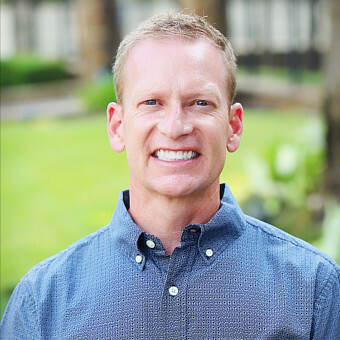 Dr. Balhoff has been a solo practitioner in his own orthodontics practice since 2004. Dr. Balhoff stays current with the latest advances in dentistry and his specialty of orthodontics through his membership in multiple organizations and extensive participation in dental and orthodontic continuation education courses across the country. Dr. Balhoff is proficient in the use of straight-wire orthodontic technique, the use of functional appliances, and the placement and use of Temporary Anchorage Devices (TADs), and he has been designated as a Preferred Provider of Invisalign®. He is a member of the American Association of Orthodontists (AAO), the American Dental Association (ADA), the Louisiana Association of Orthodontists (LAO), the Louisiana Dental Association (LDA), and the Acadiana District Dental Association (ADDA). On the state level, Dr. Balhoff has been treasurer and executive board member of the ADDA since 2008. On the national level, Dr. Balhoff has been the AAO’s Political Action Committee captain for Louisiana since 2014, and he has had the honor of being chosen to represent all the orthodontists in Louisiana since 2014 as Louisiana’s only member of the AAO’s House of Delegates, which determines policies for the orthodontic profession as a whole. Because of his extensive knowledge and experience in dentistry and the latest orthodontic techniques, Dr. Balhoff has been a guest speaker for dental professional organizations, civic organizations, and elementary schools. Dr. Balhoff is also involved in the Acadiana community. He is an active member of St. John the Evangelist (Cathedral) parish in Lafayette as a mass lector, and volunteers as an assistant swim coach with City of Lafayette Aquatics USA swim team. Dr. Balhoff resides in Lafayette with his wife Kristin, daughter Ella, son Jack, and daughter Lucy. His time outside of orthodontics is spent exercising regularly at Red Lerille’s health club, reading history and political thriller novels, and spending time with his family.